Stoke City manager Mark Hughes sympathises with the plight that Cardiff City counterpart Ole Gunnar Solskjaer finds himself in. Cardiff are in the Premier League relegation zone, six points adrift of safety with only five games to play. Solskjaer took over after Malky Mackay was sacked at the end of December 2013. "It's not easy to come in... you have to hit the ground running and make key decisions at the right time and I wish him well," Hughes told Sport Wales. "He's an enthusiastic guy, I think that comes across whenever you see an interview with Ole and he's a football person and he wants to achieve. "This year could very well be difficult but I think sometimes you learn more from seasons that test you than maybe when it's gone really well for you." Former Wales striker Hughes was a goal-scoring hit at Manchester United like Solskjaer and both men have followed their playing careers with a role in management. Hughes, 50, has managed his country, Blackburn Rovers, Manchester City, Fulham, Queen's Park Rangers and now Stoke. 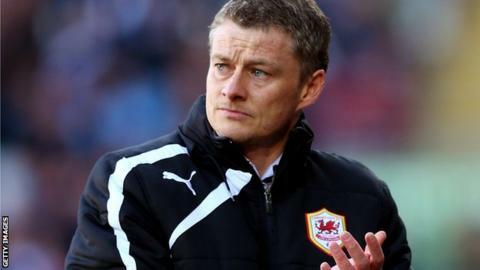 Solskjaer, 41, has been in charge of the Manchester United reserve team, Molde in his native Norway and then arrived at Cardiff City Stadium. "I've been aware of the fact for many years that Ole was held in high regard at Manchester United in terms of his desire to become a manager and a coach," Hughes said. "He was always someone who was really interested in how you set up teams and he was always looking to gain information from Sir Alex Ferguson, that was well documented and I was aware of that." Hughes faced his own relegation battle when he took over QPR in January 2012, just keeping them in the Premier League on a dramatic final day of the season. But following a string of poor results the following season Hughes was sacked by the London club, but has impressed this season with Stoke after taking over from another Welshman - Tony Pulis, who seems likely to keep Crystal Palace in the top flight. Hughes knows how hard it is for any club to stay in the Premier League, but believes that task is amplified for newly promoted clubs such as Cardiff. "It was always going to be difficult, any club that comes up to the Premier League it's a big ask," Hughes said. "I went through it at QPR - I had 17 games at the end of their first season back and I knew how difficult it was. "In the end with 10 games to go we won five of them and that obviously was what made the difference in terms of staying up that year. "It's the intensity that takes people aback when they haven't been used to the quality and intensity of the games that they face week in, week out. "If you haven't been exposed to that then it does take you by surprise somewhat. "It's not easy for a team that's come up in their first year and you've got to understand that the quality you face at Premier League level is arguably the highest in world club football. "You have to invest in more players, it's unfair to expect that the team that has brought you up into the Premier League will be good enough to sustain your position. "While you've still got a mathematical chance then you continue to try and strive to get the points that you need. "It's very difficult to say what that points total will be this year, but you'd like to think that if Cardiff get on a run then momentum is a huge thing at this time of the year. "If you've got a good group that are trying to make things happen then it can take just one result to get that momentum going, so they've got to hope they can get that." Cardiff go to Southampton on Saturday, then face Hughes' Stoke at home before games against Sunderland, Newcastle and Chelsea.